We're pleased to offer this great new collection of 25 dazzling embroidery thread colors, designed for Robison-Anton by Marcia Pollard. The Elegance embroidery thread collection is one of the most beautiful color sets we've ever seen and is sure to add style and grace to your embroidery designs! Each Elegance by Marcia Pollard Mini-King spool contains 1100 yards of high-quality Robison-Anton 40-weight rayon embroidery thread. Also see our Elegance by Marcia Pollard Collection 25-Pack for the complete set of Elegance thread colors at a discount from the per-spool price! Please note: We have attempted to display the colors of the threads as accurately as possible. However, due to monitor differences and other limitations, the actual color of the thread may be slightly different than displayed. 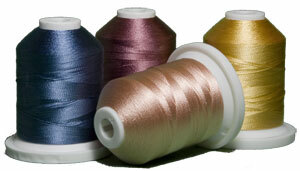 At this time, a thread color card for the Elegance by Marcia Pollard Embroidery Thread Collection is not available.